<< Back Stacy Adams. ALDRIN. BOOT. GREY. Sizes: 12.5. 13.5 14.5. Stacy Adams. ALDRIN. BOOT. GREY. Sizes: 12.5. 13.5 14.5. The Aldrin Boot along with its brothers Ashby & Armstrong are a new collection of unique shoes that blends sleek leathers or suedes with colourful accents. This shoe perfectly balances edgier components with comfort, wearability and of course true modern style. Comes with a colourful set of laces together with a spare subdued tonal set. 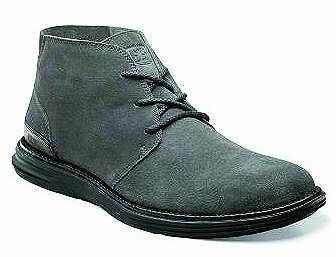 Features quality soft grained leather or suede uppers. Lightweight EVA outsole and a fully cushioned inner.